Here's the conclusion to last week's article, including a few suggestions from this parent on how to improve the overall youth sports experience. "There is no way you can convince me that this is good youth development. No way." How are these boys going to gain the creativity needed to play when Johnny’s coach yells at them for trying to backhand a ball? For swinging at a bad pitch? For trying to throw a runner out but missing that cutoff man – at age 9? It’s absurd. I’m not sure my son has ever picked a team. He’s never had to shoot free throws to decide who’s next. Lord knows he’s never made his own out call. My boy doesn't want to. He says the tournaments are boring. Who am I to argue? He’s right. As someone who knows a little about athletic development and what it takes to be good I would rather pitch 2 sessions a week, hit BP with another couple of kids, and hit infield a couple of nights a week. I figure we can work the equivalent of 6 innings, 40 at bats, and 60 chances in the field. Now you tell me. Who will get the most of their talent? Another thing. I played basketball with a guy growing up named Mark Strickland. Good player in high school but certainly not great. Mark was lucky as well. He also grew up playing at the park. He just played, and played, and played. He played enough to get offered a scholarship to Temple to play for the great John Cheney. He could jump out of the gym. That’s it. His only skill. He was a gangly kid who frankly could be pushed around. Not the most coordinated. Mark was barely an all section player in high school and at age 11 probably was not very good at all. I’m glad he didn’t play baseball and have some dude tell him he wasn't good enough and end up quitting because he finally got it and ended up playing 9 seasons in the NBA. That’s the NBA – the most competitive athletic league in the world. Should we really be in the business of deciding the haves and have-nots at age 9 or 10? Of course not. No travel ball/all star teams until age 11. 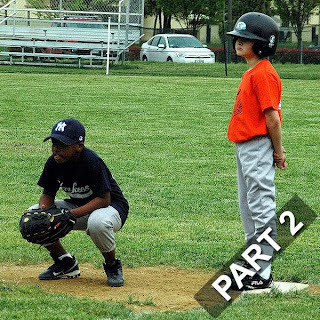 Competitive baseball can be played locally through age 10. Achieve this by running “Open Diamond” programs during the summer to encourage kids to just play. After all it’s the actual playing part that matters right? Allow young athletes to “control their own experience” more. This is something that happened 40 years ago in America and now only seems to happen on basketball courts. Tell the parents to go away for a while. I honestly believe we are doing it all wrong. I also believe that it will take some brave folks to change it.